We always get excited when strawberry season arrives! We just adore the fresh, sweet flavor of sun-ripened berries! They’re so versatile and can brighten up virtually any dish from grilled meats to sweet treats! 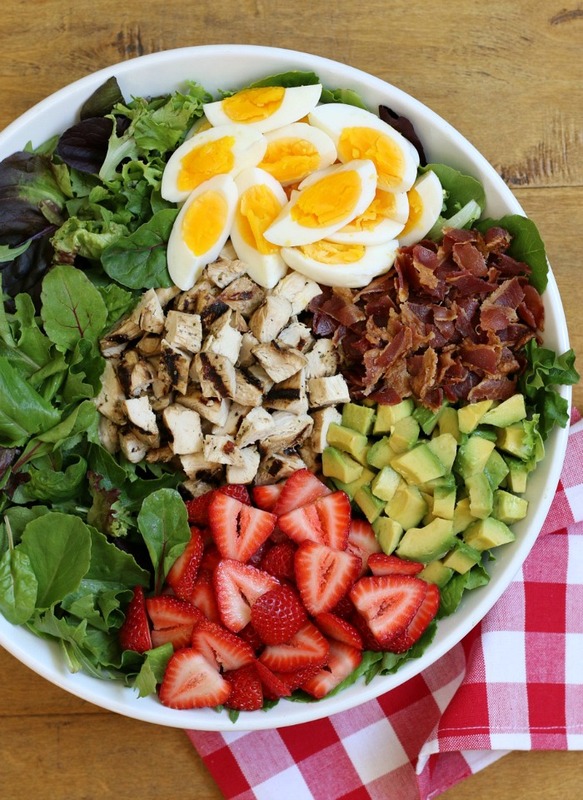 And of course, they’re the perfect addition to summer salads like this beautiful and flavorful Strawberry Cobb Salad! 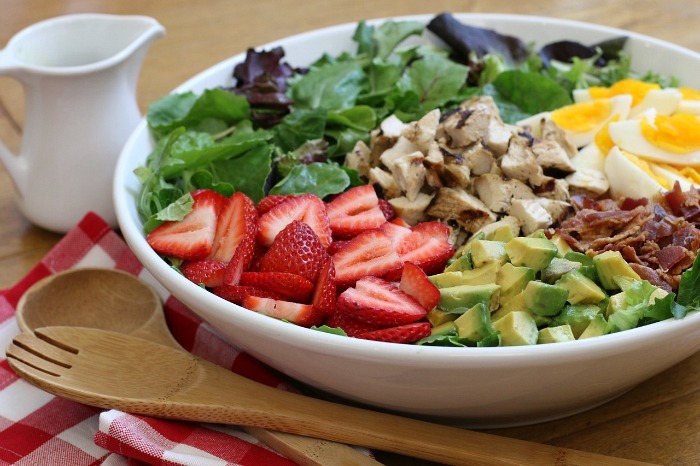 The combination of fresh strawberries with sweet and tangy balsamic lime vinaigrette transforms the classic cobb to a whole new level of yumminess! One of my favorite things about this sensational ensemble is how simple, yet elegant and satisfying it is, which makes it perfect for entertaining. We had company visiting with us this week, so I decided to serve this scrumptious salad buffet-style and it received rave reviews! Everyone, even the kids (hallelujah), enjoyed this delicious healthy salad! Another plus – it comes together in a snap with just a little prepping ahead. I made the balsamic lime vinaigrette and boiled the eggs a few days beforehand, since both keep well in the fridge for up to a week. And I also made extra bacon over the weekend and hid it in the freezer (I’m sure I don’t have to explain why?). The rest of the ingredients are super easy to pull together the day you plan to serve it. And you can opt to grill the chicken just before serving so it’s warm, or grill it ahead of time and rewarm it or serve it cold. It’s totally up to you! If you’re as excited about fresh strawberries as we are, be sure to take a peek at the delicious Strawberry Recipe Round-Up I’m sharing over at The Better Mom. It includes my family’s favorite berry-licious recipes perfect for summer! In a small bowl, whisk together the vinaigrette ingredients. Place 1/4 cup of the vinaigrette into a gallon-size baggie (or mixing bowl). Place remaining vinaigrette in a mason jar and refrigerate. Add the chicken tenders to the baggie (or mixing bowl) and toss well to coat. Place chicken in fridge to marinate for at least 30 minutes or overnight. Grill chicken tenders about 2 minutes per side, until cooked through. Transfer chicken to a plate, cover loosely with foil, and let it rest while you pull together the salad toppings. Place salad greens in a bowl and add toppings. Dice chicken and add to the salad. Drizzle the sweet-n-tangy balsamic lime vinaigrette over the top and toss. 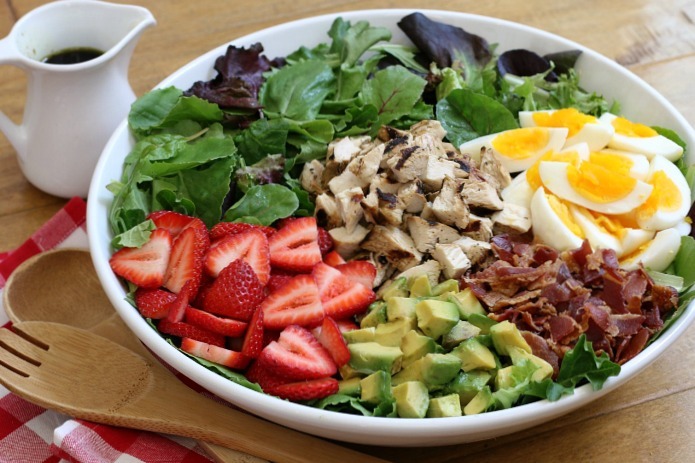 Or place each of the ingredients into separate bowls for a delicious make-your-own cobb salad buffet! Recipe Variation: This salad is also absolutely delicious with grilled grassfed steak. Just follow the same steps above to marinate the steak in the balsamic lime vinaigrette. The vinaigrette not only adds a delicious subtle flavor to steak, but also acts as tenderizing agent for a juicy, tender steak! P.S. When I’m not doing the Whole30, I like to add one teaspoon of honey to the balsamic lime dressing to add an additional hint of sweetness. I have everything for that vinaigrette at home today! Yay! Making this tonight!